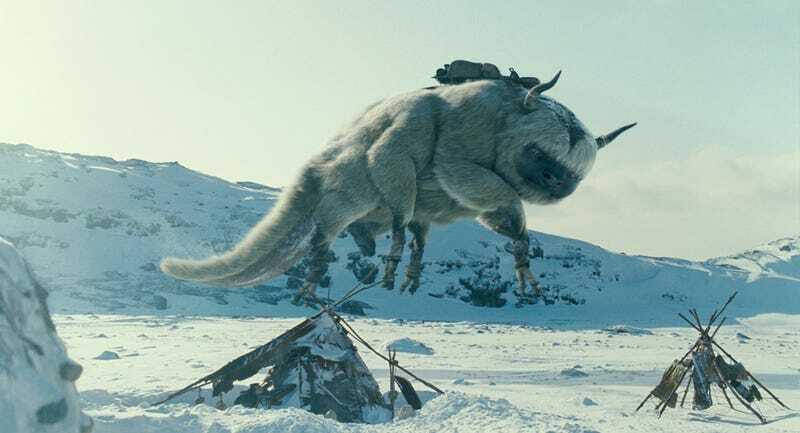 The Last Airbender will stand or fall based on its friendly creatures. So here's your chance to get an eyeful of the live-action versions of sky-bison Appa and Momo, the bat-lemur in pictures and video. What do you think? The above images were found in this little teaser trailer where you can listen to the Momo sounds! Last Airbender Fans were also sent a handful of pictures from the Airbender iphone app, which contained even more images of our favorite pet Momo and Appa. CandyMania has a short clip of a growling Appa. Which is the first noise we've ever heard from the furry beast, oh to hear the first "Yip, Yip" sounded by Aang, that will be an exciting moment! And finally Great White Snark has a video of the Momo launching Appa McDonalds happy meal toy. UPDATE: Paramount released a bunch of new stills, here they are!